Iced tea in hand, Sam Cooke on the hifi, the rocker tall is deeply rooted in Southern American porch culture. While its heritage might be southern, this contemporary Rocker by Klein Agency finds its minimal elegance in its lengthy back and slender lines. 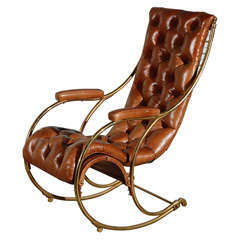 It plays with a traditional archetype; the rocker you might remember your grandmother rocking in, elevating it with and exposed, oversized bottom curve and slim vertical lines. The slim oak pieces fit seamlessly within the steel frame, creating a weaving effect. No bolts, no screws. A perfect dialogue of two materials. 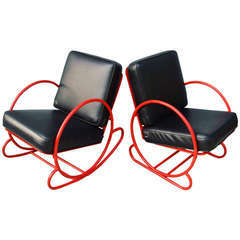 Note / Curved arch on the bottom of this rocking chair has a layer of leather attached to it, making the rocking motion smoother and the chair easily placed on the wooden floors as well as concrete or tiled surfaces. Customers can choose from different materials and finishes on this contemporary Rocking chair:\n\n1 Laser cut steel frame in 4 different finishes:\n- Oiled Natural\n- Blackened\n- Galvanized\n- Antiqued Brass\n\n2 Oak wood slats\n- Black Lacquered\n- Oiled Natural\n\nThis item is made to order in Los Angeles, CA. \nPlease get in touch for information about custom materials and dimensions. Creatively rethinking the way in which people dwell, Klein Agency focuses on simple solutions to living well. With a background in architecture and product design, Klein Agency is built on experience, an understanding of design processes, and a desire to give spaces, products and brands new, unexpected identities, rich in materials and attentive to details. Klein Agency understands and applies its’ design process in a holistic way, creating for its clients new untold stories, where all components come together in an elegant and coherent narration. 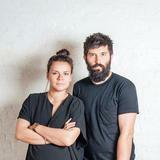 Maša and Jon Kleinhample started Klein Agency in 2015 in Antwerp, Belgium, with an idea to weave together their independent areas of expertise into one creative venture. Jon’s architectural pedigree along with Maša’s Slovenian background, which intertwine a mixture of geometric acrobatics and a rich appreciation for raw materials, is what forms the principles behind Klein Agency. The couple migrated their studio to California early 2017 and today they design out of Downtown Los Angeles. Their latest furniture line - Klein HOME - has been released at ICFF in New York in May 2017. Klein HOME is designed and fabricated in Los Angeles, California. 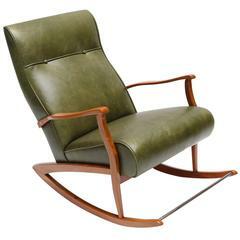 1960s Brazilian rocking chair upholstered in green leather.